Aluna Casa y Cafe i Santa Marta, Colombia: Reservér nu! Aluna Casa y Cafe is a small family run guesthouse that caters for the independent traveler looking to explore and discover the natural and cultural landscape of the Carribean coast of Colombia. We can provide you with all the information you need about where to go and how to get there. 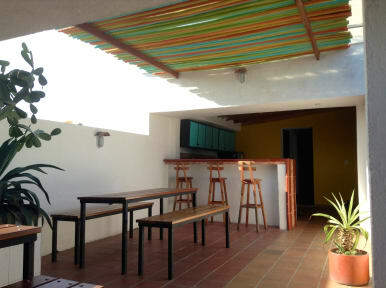 Situated in the historical centre of Santa Marta Aluna Casa y Cafe is within walking distance of restaurants, bars, supermarkets and the just 4 blocks from the beach. Aluna Casa y Cafe, designed around a 1920’s Spanish villa is centered around a shaded courtyard. The guesthouse has 3 floors, a roof terrace that looks out over the Sierra Nevada, a guest kitchen, TV room and a cafe. So why not join us for a beer or a juice and sit back and relax and enjoy the delights of the Carribbean. Suerte! Visitors to Aluna would also be offered the unique experience of staying on a Colombian farm, Entre Rios, in the Sierra Nevada.